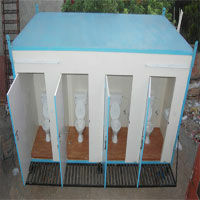 A buildTech is well-known entity involved in offering a wide range of quality assured Portable Toilet Containers. To design these containers, we are supported by a team of our skilled and proficient staff, who assemble these containers using high quality raw materials and modern technology with the set industry norms. Our Portable Toilet Containers are manufactured in customized size. Available containers approach with well-equipped facilities. Consumers can avail these Portable Toilet Containers at leading market price without any restriction according to their requirements and needs.